The Chinstrap Penguin is a species of penguin which is found in the South Sandwich Islands, Antarctica, the South Orkneys, South Shetland, South Georgia, Bouvet Island, Balleny and Peter Island. 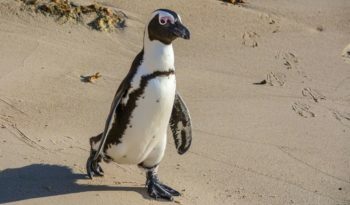 Their name derives from the narrow black band under their heads which makes it appear as if they are wearing black helmets, making them one of the most easily identified types of penguin. The Chinstrap Penguins are the most numerous penguins in the world. It is estimated there are 12 to 13 million located on the barren islands of the sub-Antarctic Region and the Antarctic Peninsula. Chinstrap Penguins live and breed in large colonies. They often live on large icebergs on the open ocean. Chinstrap Penguins dive off to catch fish and krill. 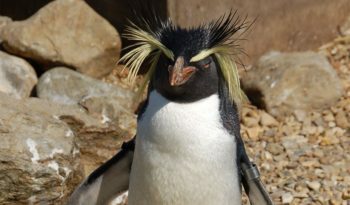 They are the boldest penguin and are most likely to fight other penguins. Other names for the Chinstrap Penguin are ‘ Ringed Penguins., ‘ Bearded Penguins‘, and ‘ Stonecracker Penguins‘ due to their harsh call. Chinstrap penguins have a white front and throat, red eyes and a black back. 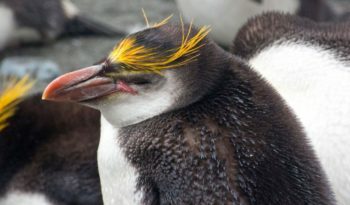 They have a distinctive black band that runs from one side of the head under the bill to the other side of the head, resembling a chin strap. Their coat of feathers is dense for insulation and water proofing and they have a thick layer of blubber as an energy store. The chicks have grey backs and white fronts. The diet of the Chinstrap Penguin consists of: small shoaling animals, krill, small fish and other roaming marine crustaceans. 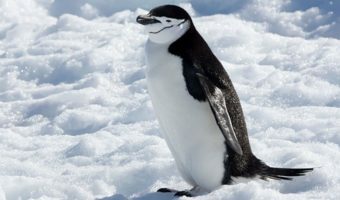 Chinstrap Penguins are considered near-shore feeders foraging among the pack ice, although vagrants may occasionally be seen in the open sea. They feed by pursuit-diving for prey close to their breeding colonies. Diving effort is usually concentrated near midnight and noon and dives typically last less than a minute and are seldom more than 200 feet deep. Like most penguins, Chinstrap Penguins use their flippers to ‘fly’ at speeds of up to 20 miles per hour. On land, Chinstraps often ‘toboggan’ on their stomachs, propelling themselves by their feet and flippers. 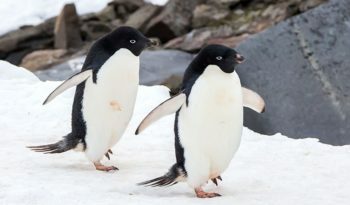 Chinstrap Penguins climb out of the water and up steep slopes using all four limbs and they are able to jump large distances to reach footholds. Chinstrap Penguins communicate through ritual behaviours of head and flipper waving, calling, bowing, gesturing and preening. Stares, pointing and charging may occur when territorial disputes arise. Chinstrap penguins make a round nest out of stones and pebbles. Their nests are usually 40 centimetres in diameter and 15 centimetres high. The female lays two eggs in November or December and the eggs are kept warm by both male and female. They do this by taking turns for 5 to 10 days, while the other mate is feeding. The eggs hatch after about 33 to 15 days. The chicks stay in the nest until they are 20 to 30 days old. At this time they have feathers to keep them warm. 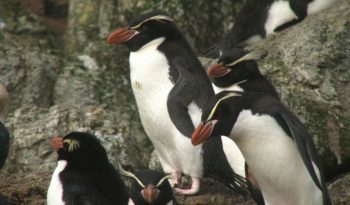 They join the crèches, which are groups of young penguins huddling together for warmth and protection. 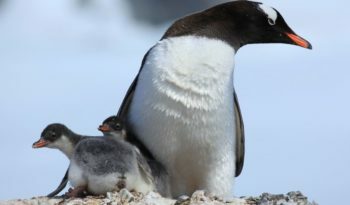 The principal predator of adult Chinstrap Penguins is the Leopard seal, while the main predators of eggs and chicks are sheathbills and the Brown skua. Chinstrap penguins are not classified as endangered by the 2000 IUCN Red List. In the past, commercial egg collecting has caused damage to rookeries, but they have no legal protection. There are thought to be up to 7.5 million breeding pairs.